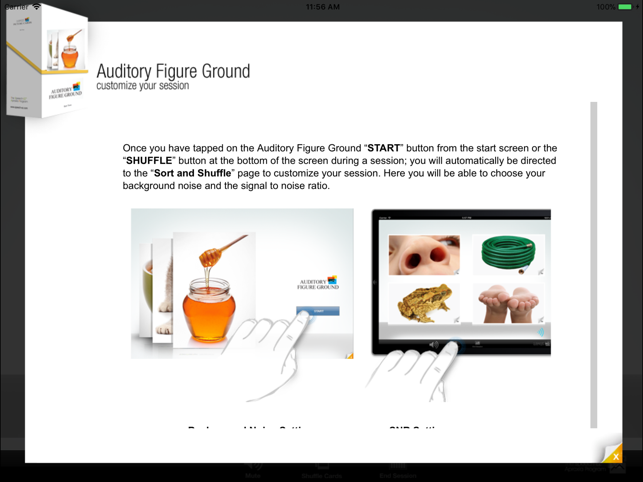 Welcome to the Auditory Figure Ground (AFG) app! This app aims to improve an individual's ability to accurately perceive speech in the presence of background competing noise. This skill is important in situations such as a noisy classroom, busy restaurant, etc. The inability to understand speech in the presence of background noise is one of the most common auditory complaints of students who have language and learning problems. 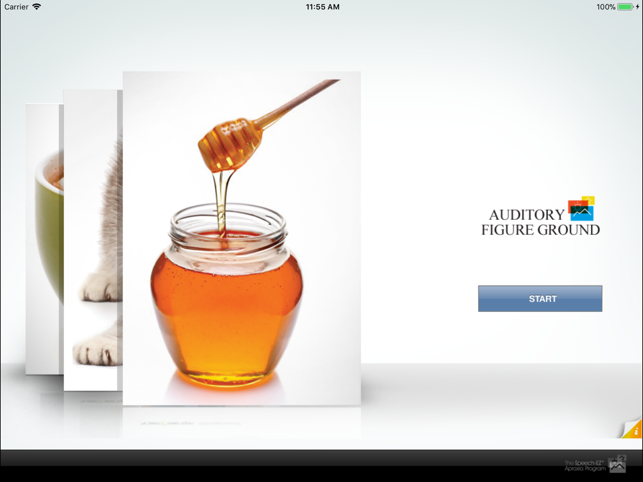 The auditory figure ground app can be used to help an individual's ability to recognize words in the presence of competing background noise. A series of one-syllable words is presented at a selected decibel level in a selected background noise type. 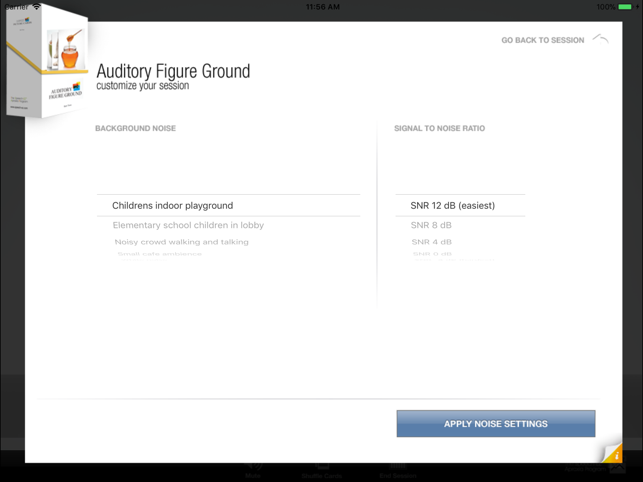 The user is able to select the Signal to Noise Ratio (SNR) and the type of background noise. The SNR is basically how much louder the speaker’s voice is, above the other noises in the room. The American Speech Language Hearing Association has set the standard on acceptable classroom acoustics. According to ASHA, the SNR should be no lower than +15 decibels (which is what a child requires for intelligible comprehension; an adult requires +4 to +6 decibels). The average classroom has a SNR worse that +4 decibels! The individual will hear a target word and be asked to select the image that represents the target word out of a field of four images. In the event that the images are not intuitive as to what they are meant to represents, you can tap on the corner of the image to flip the card to read the written word on the back. As an individual's speech perception improves at a particular decibel setting, it is recommended to adjust the setting to a more difficult level to continue exercising auditory processing abilities. This app may also be very beneficial for adults who have compromised auditory processing systems due to TBI and stroke, etc. Great for auditory processing sound discrimination. Nice settings. I use for phonological minimal pairs too. Well done. I am an SLP who I purchased this app for my son who has a history of chronic ear infections and will probably receive a CAPD dx. I love the idea behind this app and it does was it says it is going to do, but to make it a truly functional therapy tool it needs more levels. This app is great and the phonemic level and I love the options for various backgrounds and dB levels, however that is all it does. 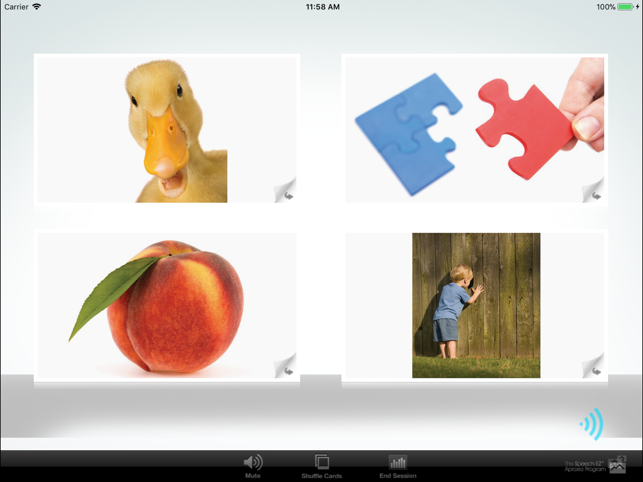 It does not include discrimination between pictures at a morphological level or sentence level (plural s, -Ed endings or simple word changes that impact meaning of a phrase or sentence. Increasing complexity of the stimulus items in a systematic fashion would make this great. 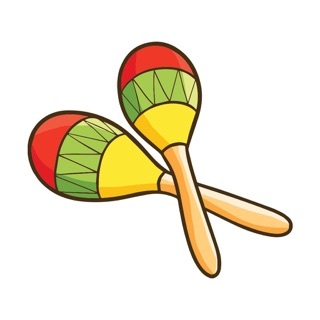 Add these and it would be a five star app. I really like this app and have found it very helpful with a few of my patients. I agree with the other reviewer about more levels. This is a unique app that offers competing noise and I think it would be useful to take it beyond the single word level. I will say that so far, it is great for auditory processing, but it has also shown me what vocabulary my kids are lacking. 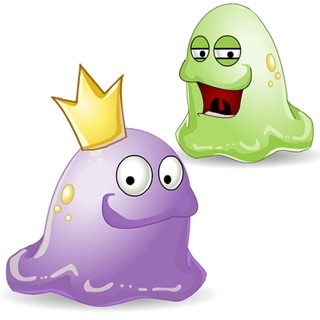 I like the quality of the images and that I can switch between images and words. I also love the different noise levels and types of competing noise.